Get ready for a cycling experience like no other! 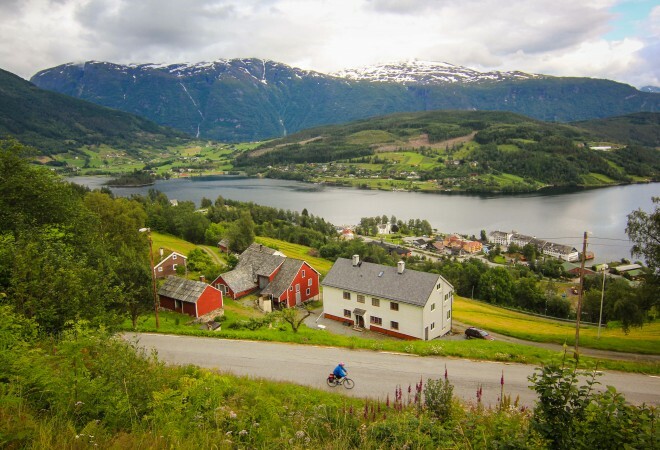 Get ready for a tour of Norway by bicycle! 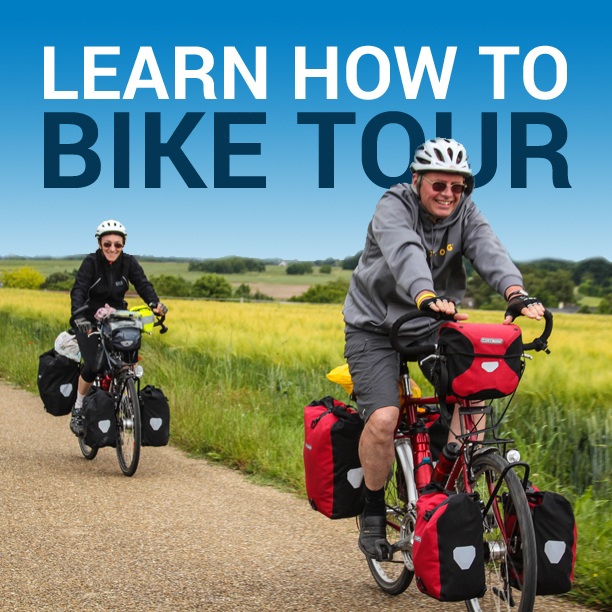 Bicycle Touring Pro invites you on a memorable 10-day bike tour across fjord Norway with Discover-Norway.com. During this incredible Scandinavian cycling holiday you’ll cycle across scenic vistas, cruise past hundreds of gushing waterfalls, zip downhill to the edge of Norway’s most famous fjords, and then spend the night relaxing in a fine hotel, being served delicious food and drinks, and soaking in a magical summer sunset. My friend Eric joined me in Norway recently on two back-to-back self-guided bike tours with a company called Active-Norway.com. Video episodes #1 – 8 below are from our first bike tour with the company – the Biking Hardangerfjord Bike Tour, while episodes #9 – 13 are from the Around Sunnhordland by Boat & Bike tour. Watch the videos below and imagine yourself participating in a similar tour of Norway! If you don’t have the time to watch all 13 videos, I recommend you watch video #4. It’s really the first official day of cycling on the bike tour… and it’s the day when Eric runs into his first big hill. Watch and see what happens! Before my bike tour Active-Norway.com could even begin, I needed to reach the city of Oslo, Norway – where I planned to meet my friend Eric who was flying in from Los Angeles, California. After cycling to Oslo from Copenhagen, Denmark, I met up with Eric and we jumped on an overnight train and headed west toward the city of Bergen, Norway, which is where our bike tour was scheduled to begin. When we arrived in Bergen on the overnight train, we walked around the city for a while before checking into our hotel in the city center and then participating in a walking tour of the Bergen city center, where we learned about the city’s famous four “Fs” – fishing, fires, fjord and the funicular railway. After picking up a rental bike for Eric to use over the duration of our bike tour, we jumped on another train and headed east for two short hours to the nearby tourist town of Voss. Once there, we walked around the city, checked into our hotel, and ate a delicious meal in our hotel restaurant. Before the start of the Biking Hardangerfjord self-guided bike tour, Eric had hardly ever ridden a bicycle, so he was wobbly and timid when he first got on the bike. Any little hill he’d come across was a major challenge. After cycling more than 30 kilometers already, we encountered a 6 km uphill climb and Eric was in for his first major challenge of the tour. On the second day of the Biking Hardangerfjord self guided bike tour, Eric and I left the Strand Hotel and cycled south along the edge of the Hardangerfjord before crossing over the water on the Hardangerfjord bridge and then crossing the fjord yet again on one of Norway’s many ferry boats. Once we reached our hotel in the city of Norheimsund, Eric and I had signed up for a guided glacier hike on the nearby Folgefonna glacier. We had to take a ferry boat and a bus to get there, but the views from the top of the glacier were certainly worth the trip. The day after our long glacier hike in Norheimsund, Eric and I jumped back on our bicycled and pedaled south on what would be the longest day of our bike tour in Norway – about 70+ kilometers. After passing through a series of short tunnels and taking another ferryboat across the waters of the Hardangerfjord, we reached our charming accommodation for the night – the Rosendal Tourist Hotell. Rosendall, Norway is a truly special place. We had scheduled another day of rest in Rosendall, thankfully, so Eric stayed in bed to catch up on sleep, while I hiked to the top of a nearby mountain. It took me about 2.5 hours to reach the top, but the views from the summer were certainly worth the effort. After our rest day in Rosendall and our second night of sleep and fine dining and the Rosendal Tourist Hotel, Eric and I began the first day of the Around Sunnhordland by Boat & Bike tour. Our first tour with Active-Norway.com (the Biking Hardangerfjord Bike Tour) was now officially over and we were only just starting on the first day of our second tour with the company – the Around Sunnhordland by Boat & Bike tour. The second day of the Around Sunnhordland by Boat & Bike tour was unique, because it was an out-and-back day, where we cycled to a nearby city, then turned around and came back the same way we had just home – which doesn’t sound all that strange, but it’s really not that common to go out-and-back in the bicycle touring world. Finally, on the last official day of our bike tour in Norway, Eric and I left the Bekkjarvik Gjestgiveri (our beautiful waterfront hotel in the tiny harbor town of Bekkjarvik, Norway) and cycled north for about 20 km to the ferry landing on the far side of the island. While the others waited for the ferry, I took off on my own on a road extending out to the west – allowing me to cycle across nine small Norwegian islands in a single day. Then, I made it back to the ferry just in time for our ride back to Bergen and the official end of our two bike tours with Active-Norway.com. With our travels by bike in Norway now over, Eric and I took the train back to Oslo, Norway where we rented an apartment in the city center and met up with my friend Roberto LoRusso, who had flown in from Italy to join me for the next leg of my travels in Norway. My bike tour with Eric and Active-Norway.com was now over, but my cross-country bike tour with Rob and central Norway was just about to begin! This entry was posted in Bicycle Touring Pro Articles, Darren Alff's Bike Tour Blog, Europe, Featured Articles, Locations, Main Articles, Norway, Videos and tagged active norway, around sunnhordland, bicycle tour of norway, bike tour of norway, boat and bike tour, cycling norway, cycling tour of norway, cycling videos, eric kiraly, island hopping, norske bygdeopplevelser, norway cycling videos, sunnhordland, tour of norway, tour of scandinavia.